Tiger Will Come Back a "Frightening Beast"
David Feherty, CBS Sports golf analyst, and Marvet Britto, an expert in public relations and brand strategy, appeared on "The Early Show" Monday to discuss Tiger Wooods' first interviews since his accident four months ago. Feherty, who appeared on the broadcast from Isleworth Golf and Country Club in Windermere, Fla. -- where Woods lives -- said the golfer was "terrific" in the interviews. Feherty, who acknowledges his own struggles as an alcoholic and addict, said Woods' interviews "resonated very strongly" with him. Also, Golf Channel broadcaster Kelly Tilghman, Feherty said, did a "superb job" interviewing the sports star, asking him all the tough questions. Now Woods should be left alone, Feherty said. "Allow him to prove what he says he's going to do." Woods also has to prove himself on the golf course. However, according to Feherty, he could be a "frightening beast" with all that's happened in recent months. Feherty said, "I really think that he will be sharp, ready, angry a little bit at some of the stuff that's gone on and ready to win." But can Woods re-establish his image? Britto said on the broadcast that he's on the road to redemption with sponsors. She observed, "What we saw yesterday was a good will interview. He reeled in the sports community, the sports community that will be very essential to crafting, helping him craft his road to redemption. So he did a comfortable interview. He's very comfortable, relaxed, compose, which was a little different from what we saw initially. But normally, Tiger's a little arrogant, a little cocky. Yesterday he was humble and contrite and eager to get back to the game that he's very passionate about." As for sponsors, Britto said Woods lifestyle on and off the golf course will be the deciding factor for advertising dollars. "I think that we saw less frequent ads and a less frequent face based on Tiger being in the forefront, but I don't think anyone was dropping him, because they're all waiting to see if he brings his 'A game' back to the golf course. 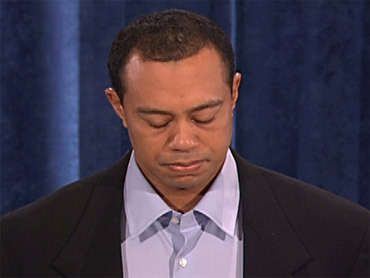 That's what will determine whether or not people support Tiger -- what does he in his lifestyle -- in the not what he says." Faherty added, "I think there will be a number of sponsors who will be kicking themselves. Other people may jump in and have the opportunity to have Tiger Woods represent them. That's a very good thing. And he has a long history -- the only mistake I've ever made in my career broadcasting golf is underestimating Tiger Woods. He will come back strong, a better person." To Faherty, Woods is giving doing what recovery programs prescribe - taking it one day at a time. "He gave me that impression yesterday," Faherty said. "He's taking it one day in the time. He's living in the present and just taking care of business."